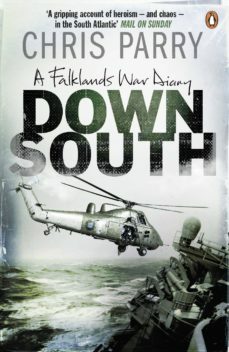 Down South by Chris Parry - one mans astonishing diary of war in the FalklandsA gripping account of heroism - and chaos - in the South Atlantic Mail on SundayCompelling, gripping. A vividly written, thought-provoking and engaging account The TimesIn 1982 Lieutenant Chris Parry sailed aboard destroyer HMS Antrim to liberate the Argentine-occupied Falkland Islands. Parry and his crew, in their Wessex helicopter, were soon launched into action rescuing an SAS party stuck on a glacier in gales that had already downed two others. Soon after they single-handedly pursued and fatally wounded a submarine before taking part in terrifying but crucial drop landings under heavy fire. Down South is a hands on, day-by-day account of war fought in the most appalling conditions by men whose grit and fighting spirit overcame all obstacles.This important and extraordinary book of recent history will be enjoyed by readers of Antony Beevor and Max Hastings.Gripping. A graphic description of just how they pulled off a real-life Mission Impossible Daily Express Excellent. A fascinating war diary Daily TelegraphVivid and insightful. Parry excels in revealing the day-to-day challenges of fighting a campaign in hostile surroundings Financial TimesA truly gripping historical account Niall Ferguson A priceless contribution to military history. Riveting Literary ReviewChris Parry joined the Royal Navy after university and then became an Observer in the Fleet Air Arm in 1979. After the Falklands War he had a successful career in the navy, and on promotion to Rear Admiral in 2005 he became the Ministry of Defences Director of Developments, Concepts and Doctrines. He was appointed a CBE in 2004. Now retired from the armed services, he heads a company which specializes in geo-strategic forecasting.